On January 9th, we announced our new deep learning processor and tools at CES 2018 in Las Vegas. Since our processor has higher performance than any other vision processor on the market, we received a lot of interest. After interviewing us, the EETimes published an article that provides additional information to our press release. In addition, our new v-MP6000UDX processor and v-CNNDesigner automated mapping tool were listed as IP of the week at the Design and Reuse website. The v-MP6000UDX processor scales from typically 8 to up to 256 cores with 64 MACs per core. This results in industry-leading performance, scaling to 25 TMAC/s and 16384 MACs per cycle, while remaining very low power and bandwidth efficient. In our private suite we showed several computer vision demonstrations running on our vision processing platform. 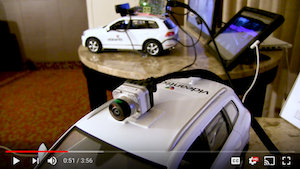 Demos included an automotive camera from ADASENS/FICOSA, Structure from Motion/SLAM, different object detectors, optical flow, OpenCV acceleration, video compression and decompression, and of course our deep learning technology. Brian Dipert from the Embedded Vision Alliance stopped by our suite to shoot a demonstration video. We’re the only company that runs all these tasks on a single unified processing architecture. 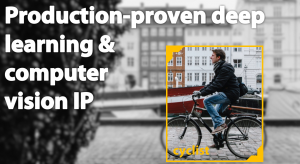 This simplifies SOC design and integration, eases software design, reduces unused dark silicon, and provides additional flexibility to address a wide variety of use cases. Besides all the deep learning news, we also announced a new SDK in December. We’ve improved several areas to ensure your experience with our software development tools is top notch. 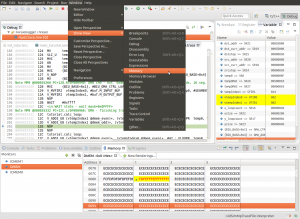 This release includes updates to the compiler, assembler, simulator, the Eclipse IDE, drivers, and tutorials. For a complete overview of the changes please see the release notes document VDC1990 version 1.6 in your distribution. Are you integrating SOCs that have videantis processors inside? Contact us to learn more about how we can help you reach highest performance and get to market fastest. Waymo is moving from R&D to true deployment and operations of its self-driving vehicles. Two months after the Alphabet self-driving car spinoff announced it would start running a truly driver-free service in Phoenix this year (as in, cars romping about with no one at the wheel), the company now unveils how it will do it: with the help of thousands more Chrysler Pacifica hybrids. Joseph Redmon works on the YOLO (You Only Look Once) system, an open-source method of object detection that can identify objects in images and video — from zebras to stop signs — with lightning-quick speed. In a remarkable live demo, Redmon shows off this important step forward for applications like self-driving cars, robotics and even cancer detection. Mobile World Congress 26 Feb – 1 March, 2018, Barcelona, Spain See us at the largest mobile event of the year. Embedded Vision Summit 22 – 24 May, 2018, Santa Clara, California The premier event for product creators who want to bring visual intelligence to product. Schedule a meeting with us by sending an email to sales@videantis.com. We’re always interested in discussing your video, vision, and deep learning SOC design ideas and challenges. We look forward to talking with you! Was this newsletter forwarded to you and you’d like to subscribe? Click here.